The durable AMACO Brent SR-20 slab roller is a fantastic fit for smaller private studios or advanced clay educational programs. Manufactured to AMACO's high standards, the Brent SR-20 slab roller is constructed of heavy gauge steel and will last for many years. This version is a mid-sized floor model that is suitable for smaller private studios and fantastic for schools and universities with advanced clay programs. 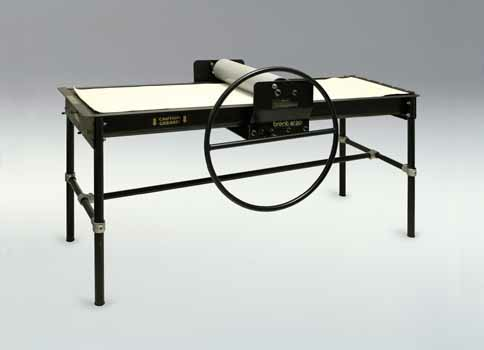 It can produce slabs up to 20" W x 52" L and allows a maximum slab thickness of 1-1/2". Two Masonite shims are provided, one 1/4" shim with canvas and a 1/8" shim without. Slabs are produced by laying clay atop the canvas-covered bed and turning the crank to move a cable-driven system of rigid pipes. Theses heavy-duty pipes flatten the clay as they move and provide consistent, even pressure. Clay thickness is determined by shims, removing them grants the greatest thickness. Assembled dimensions: 34" W x 76" L x 40" H.
Receive a $70 gift of Amaco glazes with purchase!